The plant-eating dinosaur, named Ledumahadi mafube, weighed 12 tonnes and stood about four metres high at the hips - nearly twice the size of a large African elephant. 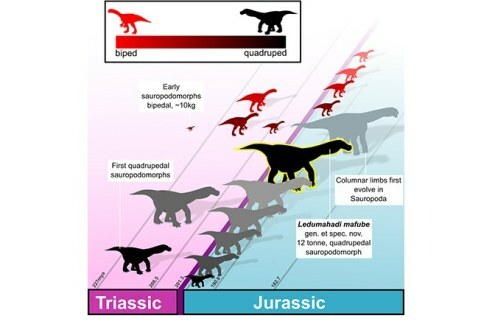 An illustration shows Ledumahadi mafube foraging in the early Jurassic of South Africa. In the foreground sits another South African dinosaur called Heterodontosaurus. 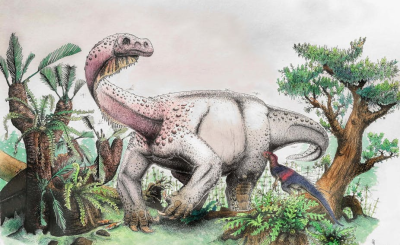 Ledumahadi’s fossil tells a fascinating story, not only of its individual life history, but also the geographic history of where it lived, and of the evolutionary history of sauropod dinosaurs. 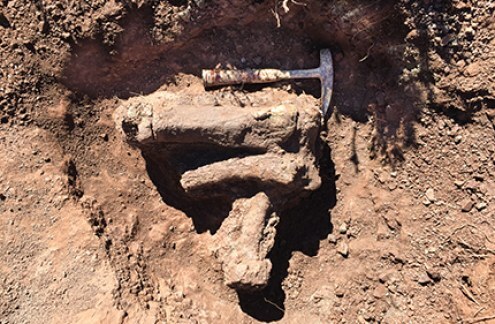 The partial foot of a large sauropodomorph dinosaur found by Kathleen Dollman and collected near Dordrecht, Eastern Cape, during a field trip earlier this year.